Mexico’s national energy company, Pemex, has been conducting hydraulic fracking to extract hydrocarbons in Mexico since 2003. However, with the recent changes on Mexico’s energy laws the activity will now be open to “Round One” tenders for direct access to fields from foreign companies such as Halliburton, Schlumberger, and Baker Hughes. According to information accessed by CartoCrítica, a civil society organization in Mexico, Pemex has registered at least 924 wells as having been drilled using fracking in Mexico, including in the states of Coahuila (47 wells), Nuevo Leon (182 wells), Puebla (233 wells), Tabasco (13 wells), Tamaulipas (100 wells) and Veracruz (349 wells). 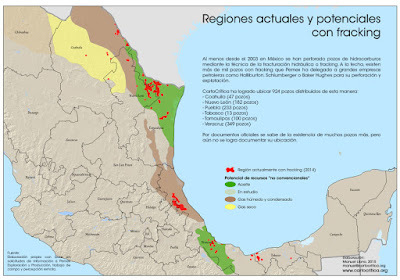 However, the Pemex document contradicts another from Mexico’s Ministry of Energy (SENER), dated April 2010, which specifically references the hydraulic fracturing of 1,323 wells, and with this greater number only being in the “Chicontepec Paleocanal”, a well-known oil field that covers the states of Veracruz and northern Puebla. CartoCrítica, in citing the discrepancy, is calling out the Mexican federal government for its lack of transparency. To date, CartoCrítica says that the government has refused to release data related to the oil industry and oil infrastructure in Mexico, which has resulted in both social and environmental risks. Specifically, CartoCrítica says that the opacity regarding oil infrastructure spans numerous areas, including: the geographic location of wells and pipelines; the minimum technical specifications for each well; the delineation of hydrocarbon fields; and the location of the boundaries, among others. There is also concern with regard to the lack of transparency within the bidding process for access to the wells. Not here, not there, not now, not ever! 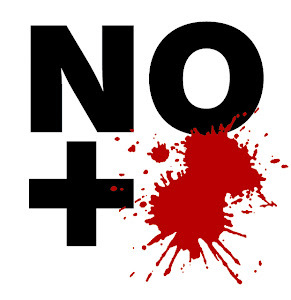 As well, the states of Tamaulipas and Veracruz are dangerous places to dissent, with civil populations and journalists terrorized by both criminal organizations and local governments. This makes resistance by organizations such as Alianza Mexicana Contra el Fracking difficult, especially at the local level. Fracking involves drilling vertical wells into bitumous shale, usually at depths of between one and five thousand meters. Due to the low permeability of shale, horizontal drilling in also done, which may extend for several kilometers in different directions. A combination of water, sand, and chemicals is injected into the fractures, forcing the oil out. This then results in a kind of “chase”, with additional drilling needed to maintain the pressure. To fracture a single well requires between 9 and 29 million liters of water. Consequently, a “successful” fracking operation covers vast tracts of land and uses huge volumes of water and chemicals. Chemicals used include methanol, benzene, toluene, ethyl-benzene and xylene. These chemicals, as well as heavy metals, hydrocarbons, and even subsoil radon can emerge in the return water, making it unusable and even untreatable. 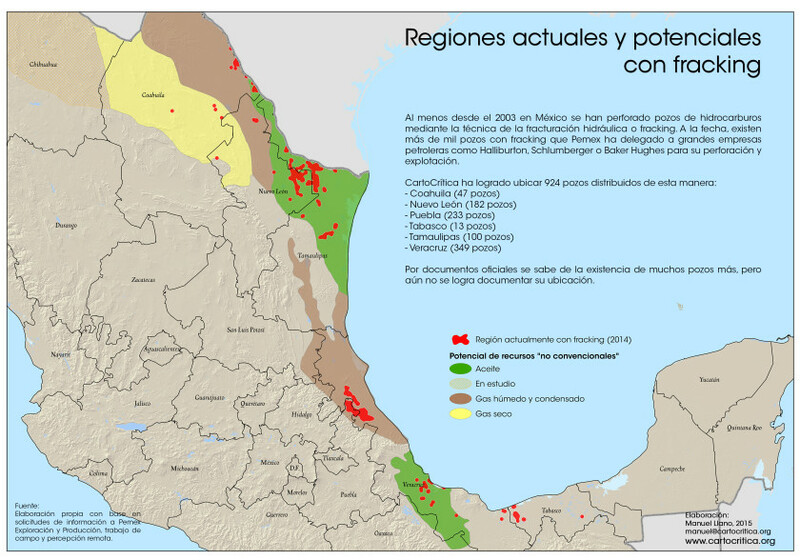 The map below shows the concentration of active fracking areas along Mexico's gulf coast. Margarita Zavala: Mexico's Hillary Clinton?